WOLFMAN WANTED! Do You Have What it Takes? 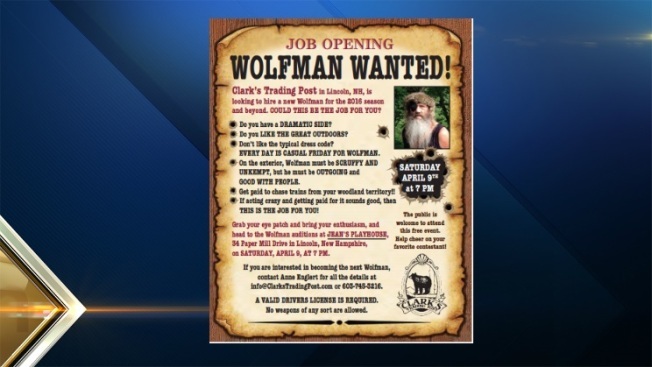 Clark's Trading Post in Lincoln, New Hampshire, is on the hunt for a Wolfman. Do you have what it takes? The family theme park is looking to hire someone for the 2016 season and beyond. Auditions will be held at Jean's Playhouse at 34 Paper Mill Dr. on April 9 at 7 p.m., according to their website. If you're scruffy and unkempt, this could be the perfect gig for you. You'll get paid to chase trains from your woodland territory! Contact Anne Englert for details at: (603) 745-3216.